Check out Tobi's Bingo Off Shoulder Crop Top Bingo: we're calling it the perfect going out top. The Sienna Bingo Off Shoulder Crop Top comes in a ribbed poly modal knit that hugs the body, with frill edges and short sleeves. A ruched cut-out at the front with crossover strap detailing raises the temperature. Pair this ruffled halter top with denim shorts. Bingo: we're calling it the perfect going out top. 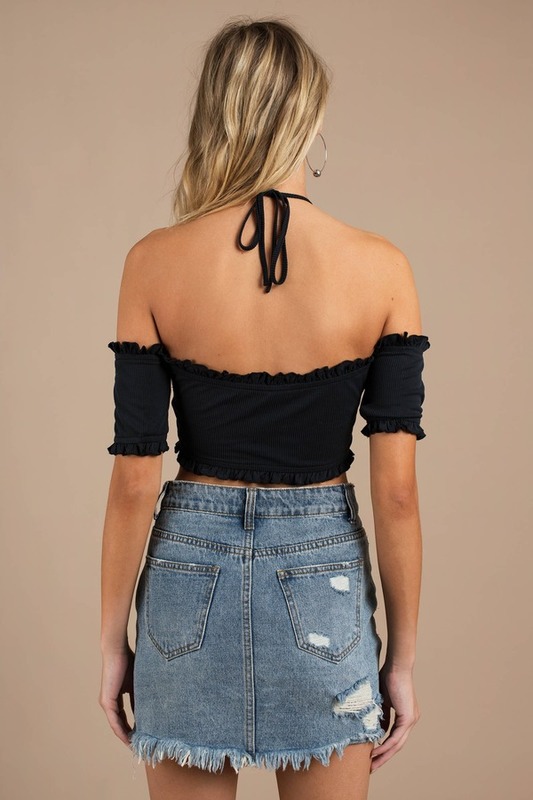 The Sienna Bingo Off Shoulder Crop Top comes in a ribbed poly modal knit that hugs the body, with frill edges and short sleeves. A ruched cut-out at the front with crossover strap detailing raises the temperature. Pair this ruffled halter top with denim shorts. Bingo: we're calling it the perfect going out top. The Red Bingo Off Shoulder Crop Top comes in a ribbed poly modal knit that hugs the body, with frill edges and short sleeves. A ruched cut-out at the front with crossover strap detailing raises the temperature. Pair this ruffled halter top with denim shorts. Bingo: we're calling it the perfect going out top. The Black Bingo Off Shoulder Crop Top comes in a ribbed poly modal knit that hugs the body, with frill edges and short sleeves. A ruched cut-out at the front with crossover strap detailing raises the temperature. Pair this ruffled halter top with denim shorts. Black, Red, Sienna modeled on a size Small.